Missing a special person can make you feel a variety of unpleasant feelings like sadness and loneliness. When your partner is far away from you,million of thoughts are passing through your head, which can make you imagine things that has no real existence. People who experience a long distance relationship are going through tough times. But here comes communication. Share your thoughts and show that you miss of him or her. 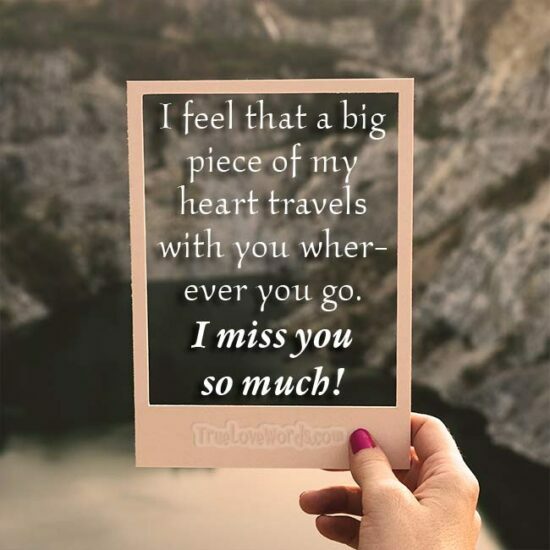 Keep the flame burning with these special I miss you quotes in the unique collection below. Share them with your distant lover and make your relationship last forever. ♥ I feel that a big piece of my heart travels with you wherever you go. I miss you so much! ♥ Counting the seconds until we’re together again, doesn’t heal my loneliness. I miss you so much honey. ♥ You need to get out of my thoughts and into my arms where you belong. Please come back! ♥ I’m incomplete when you’re away, but I feel more than whole when you’re here. ♥ Your love is like air. I will never stop wanting more and more, but I can’t touch it, because you’re away and I miss you so much. ♥ When you’re here, I want to spend every second with you. When you’re not, every second lasts too long and my only cure is to dream of you. ♥ With your arms around me, it feels like home and I’m so homesick right now. I miss you my Love! ♥ How do I know this is true love? It hurts every time I have to say goodbye. ♥ I miss you so much, despite you never left my thoughts and my dreams. ♥ I hate the moment I need to say something to you, but you’re not here by me. I miss you. ♥ Let’s promise each other to never say goodbye. Let’s promise that we’ll always be together even when we’re not. ♥ I wonder if you miss me the way that I miss you. Can you feel my heart calling out for yours? ♥ When I am in a crowd of people, I think about how much I miss your gorgeous smile. ♥ The sunsets here are wonderful, but my heart aches because I can’t share them with you. ♥ It’s beautiful here, but not as beautiful as you, and having you with me to share it. ♥ I wish you were here and we could enjoy all these wonderful things together. ♥ The world just doesn’t seem the same when you are not beside me. ♥ Every song I hear reminds me of how much I miss you and want you by my side. ♥ I am praying for the day that we are together again because every moment without you is heartache. ♥ I long for you in ways I would never have expected and cannot wait to be with you again. ♥ I daydream about meeting you at the airport and ending our time apart with a kiss. ♥ I fall in love a little more every time I see you and I can’t wait to see you again. I miss you so much! ♥ There are incredible vistas all over the world and I want to share them with you. ♥ All these beautiful sights remind me of the angel I have waiting for me back home. I miss you like crazy! ♥ I think about you all the time while I am away and I hope we are reunited soon. ♥ My heart is empty without you and I look forward to the day when it will be full again. ♥ You are my soulmate and I want to spend the rest of my life with you. ♥ I am counting the minutes until I can see you again and hold you in my arms. ♥ I miss waking up next to you and looking into your eyes while the sun shines through the curtains. ♥ You are a blessing to my life and I no longer want to be apart from you. ♥ You are my everything and there is nothing I won’t do to make sure we are together again. 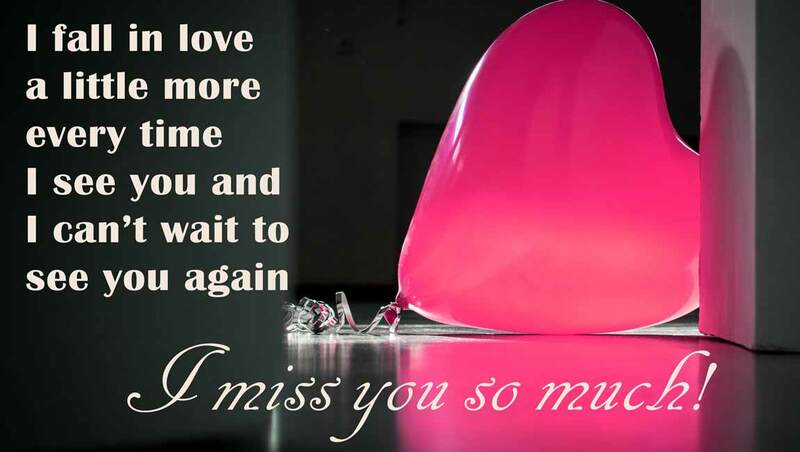 ♥ I cannot wait to close the distance between us and tell you in person how much I love you. ♥ You complete me and I cannot wait for the time we are able to see each other in person again. ♥ The world feels so empty without you and I am waiting for the day we can finally close the distance between us. ♥ No matter how many oceans there are in the world, I will always travel back to you. ♥ I never thought I would be so lucky as to have you in my life and I am counting the days to when I can hold your hand in my own. ♥ Your love is a miracle and I can’t believe I’ll be able to hold you when I finally return. ♥ I am so in love with you and can’t wait to see you again. The world is not the same without you. ♥ Please don’t forget about me, I will be back as soon as I can and wrap you in my arms. I miss you. ♥ You are the love of my life and I promise we will be together forever when I return. ♥ I have never loved another person the way I love you and cannot wait to close the distance between us once and for all. ♥ In all my wildest dreams I wouldn’t have believed I could end up with someone as wonderful as you. I miss U! 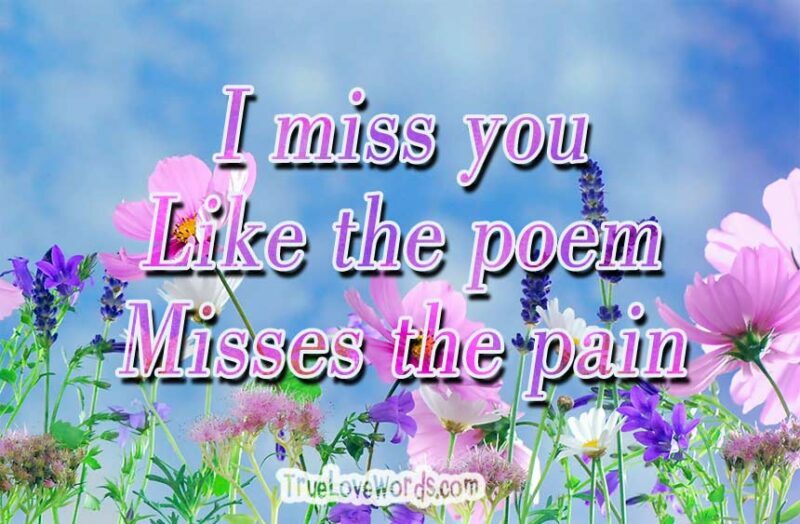 ♥ I miss you every day I have been gone. You are perfect to me and when I return I will prove how much I love you. ♥ You are the light of my life and you keep me going through the darkness. I miss you so much!